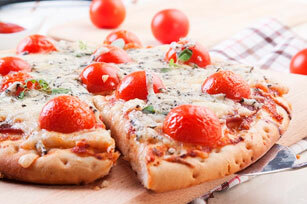 Blue cheese adds distinctive flavour to this elegant (but easy to make) pizza. Toppings include prosciutto, fresh basil and cherry tomatoes. Unroll and press dough onto 12-inch pizza pan sprayed with cooking spray. Brush with dressing. Bake 5 min. Top crust with remaining ingredients. Bake 10 to 12 min. or until edge of crust is lightly browned. Substitute Cracker Barrel Shredded Mozzarella Cheese for the Cracker Barrel Shredded 4 Cheese Italiano Cheese.